This may sound like common sense, but this is a key element in ensuring the cleanliness of your lenses. Your hands come in contact with a lot of different substances. These substances can be transferred to the contact lenses and potentially cause harm to your eyes. It is very important to wash your hands before you begin handling your contact lenses. A clean contact lens case is key to clean contact lenses. The cases can build up a collection of grime over the course of time. This build up can get in your lenses and then eventually make its way to your eye which can be very harmful. Washing your case every day, by rinsing it with solution, is a good way to ensure your cases cleanliness. It is also recommended that you replace your contact case every month. – Saline Solution – For rinsing and storing contacts. – Contact Cleaner – For daily use. Also can be replaced with filtered water. – Hydrogen Peroxide – A Supplement to other cleaners. – Enzymatic Cleaner – Disinfects soft contact lenses. Your contact lenses should never come in contact with anything but your eyes, filtered water or contact solution. Also to keep your lenses fresh, it is important to only wear them when you are actively using them. It is also very important to always remember to remove your contacts from your eyes before you go to bed. Your eyes change over time. This means that your contacts will also need to be changed. Routine eye exams are very important, this will also help you stay up to date with new solutions as well as new contacts. 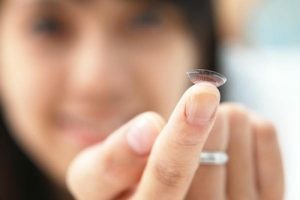 Please contact Good Looks Eyewear if you have any questions about your contact lenses, or if you are interested in more ways to improve the lifespan and cleanliness of your contacts.